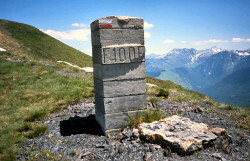 There are 720 borderstones and bordercrosses in the Pyrenees between France and Spain. My project is to find and photograph them all. And to connect them with a long-distance trail: the GRPdesBF. Why? Well, since they're there! And because they are all cultural-historical monuments, worthy of preserving and documenting. But most of all: searching them is such an inspiring way of walking and discovering the Pyrenees. This website tell's the story of my adventure which started in 2000. It might get you on the 'border-track' yourself. both in the physical sense and metaphorically.